Be the first to share your favorite memory, photo or story of Annie Mae. This memorial page is dedicated for family, friends and future generations to celebrate the life of their loved one. Annie Mae (Hall) Reeves resided in Durand, Georgia until she met her husband Calvin Coolidge Reeves, Sr. (Deceased) married him on April 21, 1946 moved to Seville, Florida for Seventy-three years. 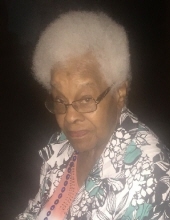 Annie Mae Reeves worked for Volusia County School Board as a lunchroom cook at Seville School for the coloreds before being integrated over to Seville Public Elementary School in 1968 for thirty-two years. Annie Mae Reeves also worked for Volusia County Park and Recreations for eighteen years. On March 15, 2019, when you heard your shutters on your windows rattle, seen two beautiful lights approach you, and felt a gentle touch on your face that was our mother and your grandmother telling us Good-bye. To all my wonderful children I’ve gone on with your daddy, momma body was tired so please don’t morn to long, remember the great days I seen with all of you. Please remember a Mothers love to her children, grandchildren, great-grandchildren and my great-great grandchildren is so true. Annie Mae prayers were answered and her soul went home to her husband awaiting arms. Leaving us not to cry or morn to long: Daughter Barbara J. Armbrister, Rochester, New York; Sons LCMDR, Ret. Calvin C. Reeves, Jr., Atlanta, Georgia; Lt. Col., Ret. Earl L. (Sharon) Reeves, St. Petersburg, Florida; MSG, Ret. Raymond P. (Sabrina) Reeves, Atlanta, Georgia; SFC, Ret. Randolph R. Reeves, Fayetteville, North Carolina; Daughters Mahalia Y. (Joe) Johnson, Seville, Florida; SPC, Ret. Maria T. Maddox, Seville, Florida; Lucille M. (Robert) Johnson, Sr., Crescent City, Florida; Carole L. Reeves, DeLand, Florida, Grandchildren, Great-Grandchildren, Great-Great-Grandchildren, Aunt Willie Mae (Uncle Henry Lee deceased) Howard, Seville, Florida, Sister-in Laws Etha (Burt Deceased) and Febi (Edgar Deceased) both of Atlanta, Georgia, Juanita (John) Reeves, Seville, Florida and a host of nieces, nephews, cousins , friends and extended families are loved dearly from Annie Mae (Hall) Reeves. We know Annie Mae joined in her home going her husband Calvin (Bae) as well as her mother and father Mahalie and Willie Hall, brothers Willie (Vie) Hall, Burt Hall, Edgar Hall; son Douglas L. Reeves; grandsons Aaron T. Maddox, Thomas J. Reeves; granddaughter Martina A. Reeves; and a vast host of family and friends. Devoted Friends Emma Lee George; Theresa Hankins, Addie Mae Addison thanks for being there for me. To send flowers or a remembrance gift to the family of Annie Mae Reeves, please visit our Tribute Store. "Email Address" would like to share the life celebration of Annie Mae Reeves. Click on the "link" to go to share a favorite memory or leave a condolence message for the family.